Most students who learn to play the piano will encounter at least once, and possibly multiple times, the experience of preparing for piano recitals, concerts, auditions and exams. And if we really think about it, we can see that a recital is a unique occasion. The student is bringing music, the most sublime and beautiful of art forms, to life. A student’s recital is a significant and noble endeavour! For a moment, imagine a child as she or he anticipates performing in a recital. Children are enormously sensitive, often more than they reveal. When a child goes into a performance or recital, whether they’re conscious of it or not, they’re in a completely exposed situation. They’re alone on the stage, with all eyes (and ears) upon them. Depending on what happens, a recital may help a child gain confidence and poise, or result in the very opposite. When I was eight years old, I began studying the piano. I had a wonderful teacher, and each year she’d host a student recital before the summer holidays. I’d prepare for these recitals diligently. I looked forward, a little nervously, to the afternoon when all of us students, and the parents, gathered at my teacher’s home. We’d enter my teacher’s living room (where she teaches to this day! ), her two grand pianos placed side-by-side. We’d take a seat on the sofas and chairs, or sit cross-legged on the plush red carpet. In turn, we’d go to the piano and announce our piece to the audience. Then we’d play, endeavouring to make our performance the best it could be. Afterward, in the warm breeze of summer, we’d enjoy cookies and punch my teacher offered on the outdoor patio of her home. We felt appreciated and acknowledged. We’d each performed the music we’d studied, and shared the joys of that music with others. When your child performs music, it’s an opportunity to let your child know they’re supported. In the best-case scenario, you’re a team with the child’s teacher–someone who is sensitive and aware, too. 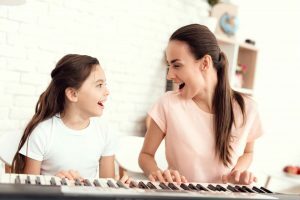 Here is an article on finding the right piano teacher. The child realises they’re not alone, which helps him or her step out, to bring music to others. In knowing that people are ‘in the wings,’ your child is buoyed! In this way, your child will build self-reliance. Which means, autonomy. Whatever the audience or judges’ response, the student learns to evaluate him or herself based on their own sense of things. With the guidance of a good teacher, the student considers their performance with interest and honesty, “Did I succeed in bringing my inspiration and the beauty of the music to people?” In this way, the student’s confidence will grow and endure–for a lifetime! In a recital, the student is building a bridge between their own practice, and sharing his or her attainment with others. It’s like being an athlete–a gymnast, a figure skater, a surfer–someone who’s practiced for an event and then goes in front of the audience to give everything they’ve achieved, and more! Practicing for a performance is to apply one’s self to achieving something wonderful! The student is dedicated to a goal and purpose, developing focus, self-discipline and commitment. These qualities build character, and can be applied to any aspect of a student’s life! Do a little research about the composer and the piece you’re studying. What do you think the composer was trying to communicate? This is a really significant question! All music, regardless of how famous, was created by someone sitting in front of a blank sheet of paper, endeavouring to express him or herself. Imagine you were there as it was happening! In light of your research, ask yourself, what is the meaning of the piece? What is the feeling? What inspired you to learn the music? This will inform your practice and interpretation of the music! Remember, you’re literally forming new brain connections as you learn to play! Slow and accurate practice is essential. Listen to your playing–what needs improvement? Focus on the difficult sections of the piece, rather than always returning to the beginning. Put the sections together as if you’re building a house, brick by brick! A good teacher will help you. Memorisation is a significant aspect of performing. As you practice your piece, create musical “anchors.” These are sections, perhaps 2 or 3 bars in length, which you know really well! Practice and memorise the notes, the chords and harmonies. You want to be able to easily picture these sections under pressure. You can even copy them onto manuscript paper. These little ‘anchors’ will give you confidence when you perform! As you’re developing a piece, record your playing. When you listen to your recordings, you’ll begin to hear yourself objectively. This will help you discern how you’re doing. Really listen and evaluate the aesthetic and technical elements of your playing. It’s a bit like becoming your own teacher! As you complete the piece, schedule a ‘trial’ performance. Ask family members or friends to attend. People you feel comfortable with. Before you sit down to play, announce the title and composer. Say something about the history and feeling of the piece, and what it means to you. Bring people into the experience you’re about to share! And…at all stages of your practice, remember what you love about the music. That’s the most important thing. Allow your inspiration to carry you! When I was 15 or 16 years old, my teacher suggested the idea of piano competitions–where I’d be judged and evaluated. By that time, I’d done many of her little recitals, and I wasn’t a child any longer. But still, I was nervous! When she suggested the idea, I’d been practicing Mozart’s Piano Concerto #21 in C Major. I’d first heard the sublime 2nd movement and knew, I had to play it! That’s what inspired me to learn the whole concerto–fifty-two pages of music. It took me two years! Finally, I was ready to audition. I had prepared for my recital and it was my first time performing before a panel of judges. I would be playing on a huge, concert grand piano in a vast auditorium and I was nervous! But with my teacher’s support, I did well. And that gave me the wonderful opportunity to perform my Mozart concerto with a real orchestra! Over time, I entered several other competitions. In one audition, I reached the 2nd movement–the beautiful theme that I loved so much. I don’t know what happened. Maybe I was tired. I’m not sure. But, I lost track. And I hit a wrong note–in one of the most well known melodies of all time! The note rang out like a strange, off-key bell! Everything stopped. I was startled! Then I remembered my teacher, and how she’d taught me to keep going, no matter what. So I continued and finished the performance. I didn’t win the competition. But for years afterward, my teacher and I recalled with humour how I re-wrote Mozart that afternoon! I’m not suggesting that you emulate this experience. The melodies of these great pieces are beloved for a reason! But I want to put ‘perfection’ in a larger context. Life is grand and uncharted. There is a value to imperfection. Mistakes have been the source of incredible inventiveness in the history of humankind. After all, when Mozart, Beethoven and Chopin were composing their famous pieces, the music didn’t exist before these composers created it. Who knows how many ‘mistakes’ went into the process! Now in my own music making, I do a lot of composing, improvising and arranging. Perhaps that audition, years ago, gave me an ability to let go, to move beyond the boundaries of the familiar. I’m writing and re-writing music all the time! Indeed, new music arises from new ideas, and sometimes these come from “mistakes.” There’s an enormous freedom we can begin to have here! If you feel nervous, believe me, I understand. When I was performing and under a lot of pressure, sometimes my hands would shake, literally. Sometimes my foot would tremble on the pedal. The nature of performing is that you often feel exposed and vulnerable (remember what we said at the beginning about children and performances!). It’s very understandable that you feel nervous! When you first sit at the piano to perform, take a few moments. Breathe. Relax. Take time. It’s okay. Think of the people who care for you, who are supporting you. Then…consider the music you’re about to play. What do you like about the piece? Is it lively with the runs of notes? Does it have a calm and flowing melody? Is it strong and bold in mood? It must be as if the piece you’ll play is your own. You’re there to express what you love about it! Take a moment and begin with that. Remember your musical anchors and practice them in your warm-up for the performance. If you have a memory lapse, you can go to these familiar places. They’re like your friends! Now, I want to share something with you…it may seem a bit funny, but it worked! In one performance, I was sitting at the piano about to begin. There were 300 people waiting for me to play. I felt nervous and when I touched the keys to play the music I’d studied and loved, my nerves started to overwhelm me. I could feel it and I didn’t know what to do. Suddenly, an image came to my mind. This may sound amusing. But it was an image of a cow. Yes, a cow! The cow was standing calmly in a vast field of green clover. It was happy and at ease, its head lowered to the grass as its mouth moved slowly back and forth. That’s the image that came into my mind–the cow and the beautiful green grass! As I played, I turned my mind to that image. I began to feel easeful, just like the cow. The notes and phrases of the music unfolded, and I kept picturing that peaceful cow. And as I did, I became calm and slowly my nerves subsided. So, perhaps there’s an image that comes to you, too–something that has a calming effect. You can use that. Over the years, I’ve created many audio recordings of my playing. It’s proven to be important! Right before your performance, listen to an audio you’ve made of your playing. It will ground you in the feeling of the music, and of your playing. And like the musical anchors and calming images, it will help give you strength and self-assurance. I’ve also listened to recordings of my favourite pianists, too. I’ve done it as part of my warm-ups when preparing for piano recitals, and it inspires me. Listening to a beautiful recording of my piece is like stepping outside of time into the pure essence of what I’m about to play. It’s given me strength and enlivened the feeling of the music inside me! Finally, no matter what happens during the performance, you always have the ending! Even if you make mistakes or forget your way, don’t worry. You can end the piece with poise and grace. It’s an incredible thing to observe, and will inspire anyone who’s watching. When you reach the final bars, keep yourself focused. Listen to the last phrase as you play, and the final note as it dissolves into silence. Hold the audience in the majesty of the music. That’s what will stay with people long after the recital ends. You’ve created a beautiful, memorable experience. That’s mastery! So, dear parents and students, I hope this article was helpful. As I said at the beginning, you’re embarking on one of the noblest endeavours! I encourage you to form a wonderful team with each other, and with the teacher. You’re doing something of rare value that can inspire listeners for days, weeks and even years to come! People long for the beauty you’ll create at the piano. They need the inspiration you’ll bring them. The world needs it! Always remember that!